Today on homify we're looking at a spacious, modern family home in the country which harnesses the energy of the sun with an entire roof of solar panels. 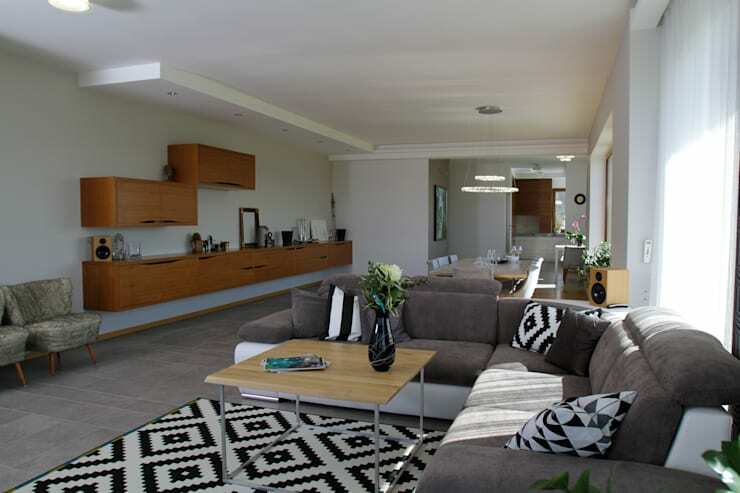 The interior is a mix of contemporary styles, with the occasional surprise decoration or two. A happy mix of progressive, eco-friendly credentials with traditional aesthetics, it's a treat to explore. Come inside and take a look at what is a fascinating prospect! There's something charmingly traditional about this home's facade, with its sloping roof and simple front garden. The cool grey walls are offset by rich wooden window frames, while a narrow rustic chimney completes the look. Here we see a simple palette of greys and whites covering the carpets, walls and ceiling, broken up by a black and white diamond-patterned rug and cushions. Wall-mounted timber cabinets stretch along the long wall for both storage and aesthetics. Co oglądać? Widok za oknem czy TV? 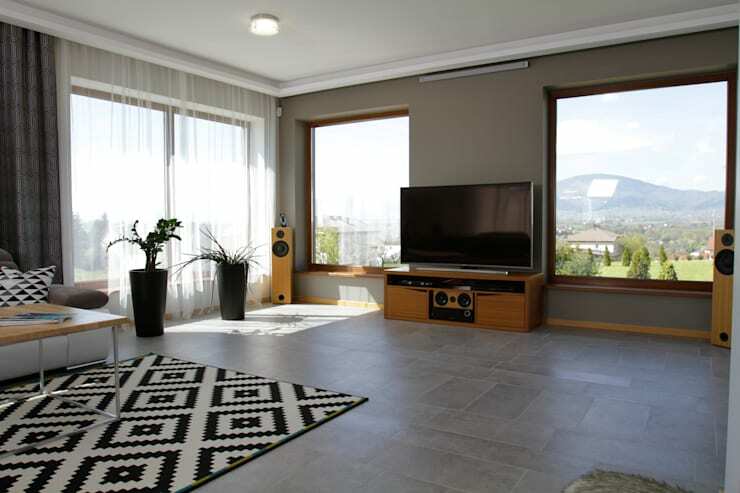 This living space is all geared towards what we want to see. 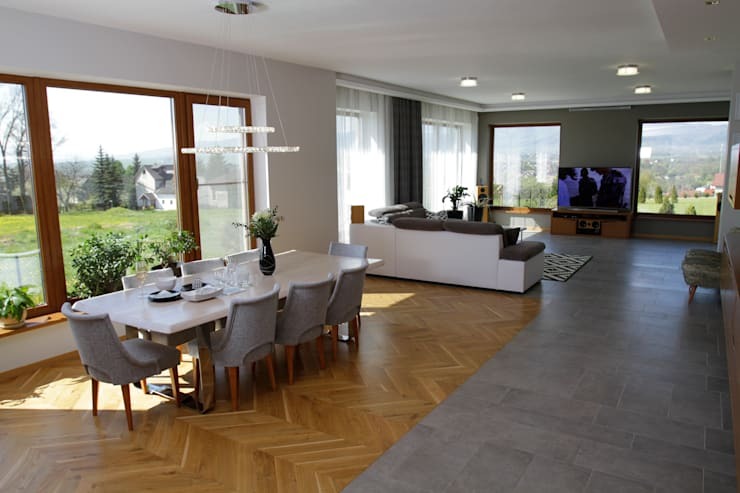 In the daytime, excellent views of the countryside will be the main draw, hence such large windows which not only frame the scenery, but also flood the room with light. Obviously the owner appreciates movies or television, and the setup here is beautifully finished in wood, with open-front speakers. How can you make a room appear bigger or simply make everything feel a little less cramped? Why, knock through the living room wall to encompass the dining area too! Or simply have your architect plan this in the design if you're building a new property. Space and light flood the area due to the lack of interior walls, with everything seeming far bigger than it would in a more traditional home. The kitchen has certainly lost any unnecessary objects, with everything neatly stacked or stored efficiently. Notice there are no cupboard or drawer handles, and the oven is contained within the surrounding units. 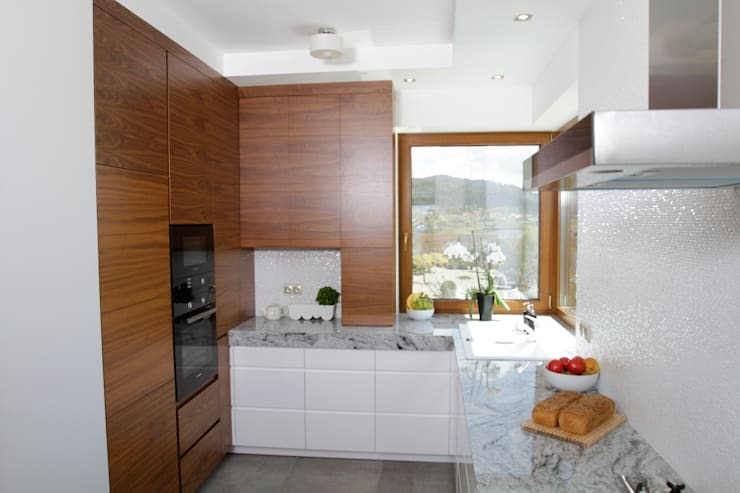 The wood effect goes well with the marble counter tops and the tiled flooring. Light is permitted through a well-placed window which affords terrific views of the landscape outside. 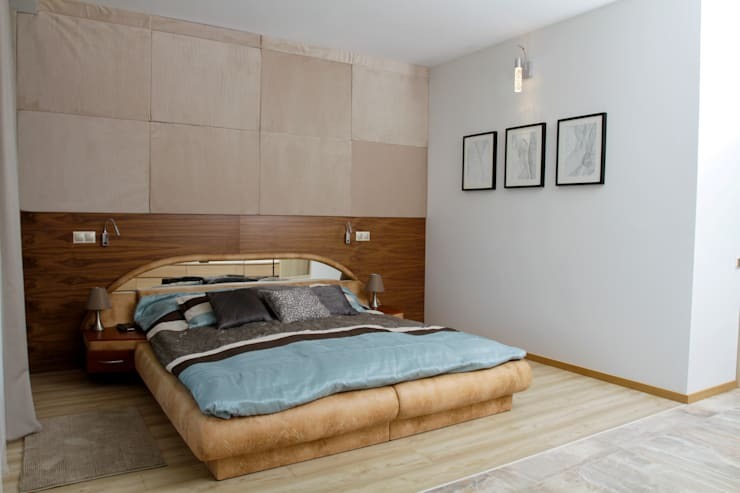 A huge tiled wall, with the use of wood for some split-level design, gives a charming retro theme to this bedroom. A huge double bed in camel, contrasted by pastel blue, is certainly unique. Flooring is what delineates the space here, with a horizontal wood grain placed next to the tiles in the adjoining room. Well, this is certainly a great way to cut down on electricity bills. With the modern concerns of climate change and energy conservation, it is considered the future to use as much renewable energy in one's house as possible. Here we have a great example of modern environmental thinking. A whole roof covered in solar panels, which convert the sun's energy into electricity to run the home. Not only does it save money for the homeowners, it also uses less energy from the national grid thereby reducing pollution as a whole. 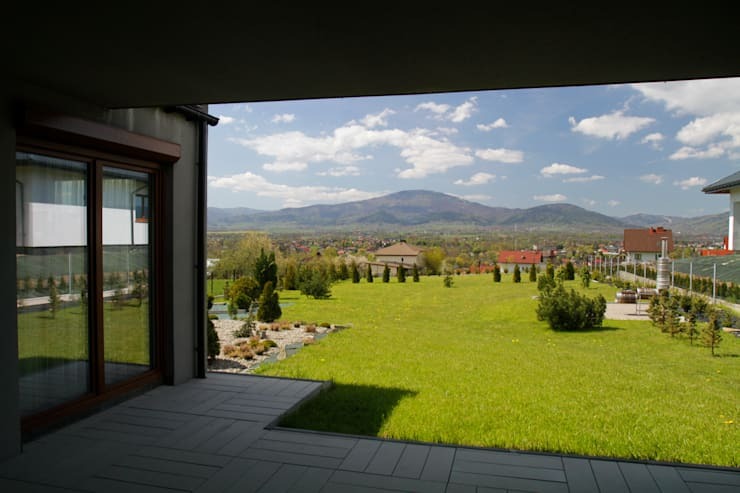 Not many people will be lucky enough to have a front porch which looks onto such a magnificent view! The rectangular tiles are in stark contrast to the lush flowing landscape before us. Big windows from the living area encourage splendid afternoons daydreaming of skies and mountains, while the expansive garden gives a sense of freedom and relaxation. 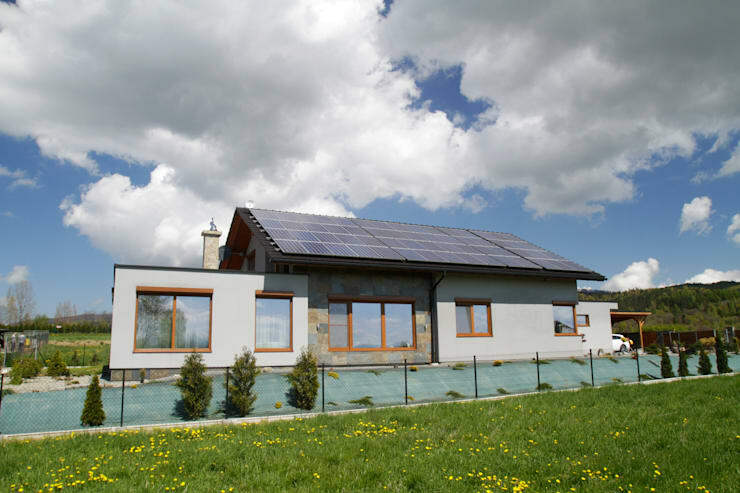 How do your energy-saving credentials compare to this home?